Copyright @ 2000-2003, Lynn Conway. 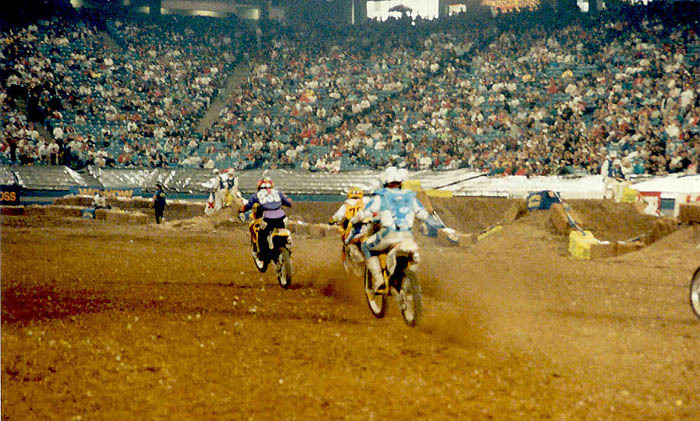 Supercross is a form of motocross racing done on highly technical tracks inside large sports stadiums. 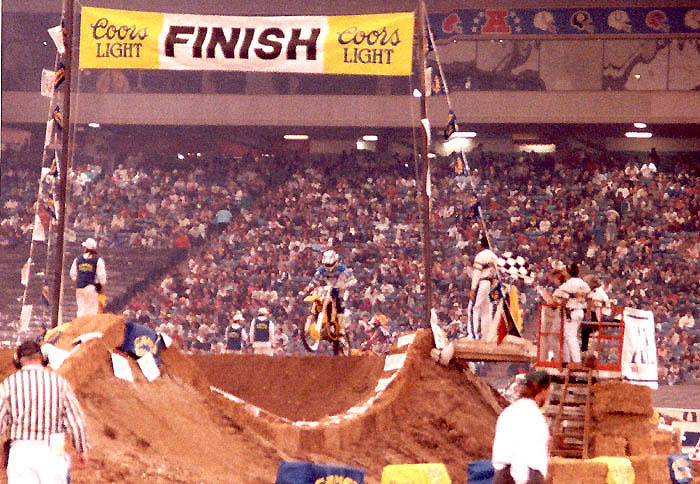 If you've never seen a professional supercross race or if you've only seen it on TV, you really should try attending one in person sometime. You will be astounded at the incredible skill of the professional motorcycle racers as they negotiate huge triple jumps and tight turns on powerful bikes while engaging in extreme racing competition. You can find the Supercross season schedule, and the dates/times events are shown on TV, at the Pace Supercross website . You'll find detailed ticket and location information there, and also a neat supercross photo gallery. Event coverage can also be found in the Cycle News website. 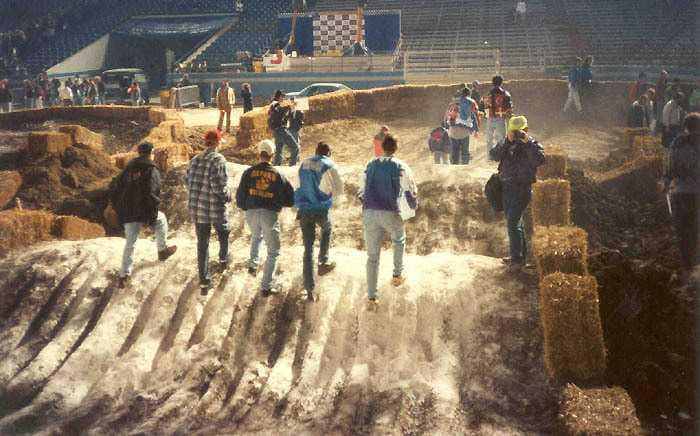 In the past, amateur racers in the midwest had a chance to try supercross racing on the big indoor track at the Pontiac Silverdome near Detroit, Michigan (back when the races were held there). The pro races were held on a Saturday-night each spring; the amateur race events were run during the day the following Sunday. 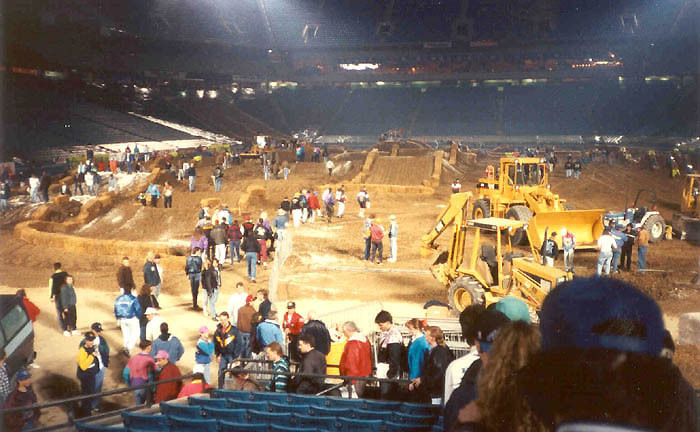 That's how I got my chance to race on the Silverdome track - as part of the amateur events there in 1993 (see below). It was quite an experience! Following are some photos and notes from my experience with supercross. 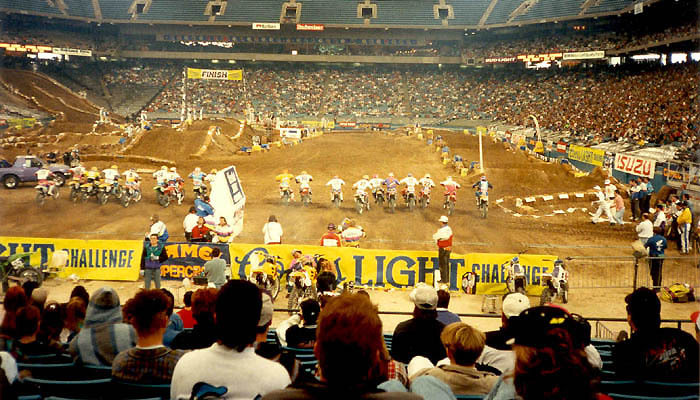 On April 18th ,1993 I had a chance to race in an amateur event in front of the full crowd of spectators in the Pontiac Silverdome. This race was held as part of the "intermission entertainment" during that evening's professional races (instead of being held on the following Sunday). In the majority of amatuer motocross racing, guys and gals race in the same classes based on skill level and age, just as in auto racing. However, at the national level, some championship classes are set aside for women. For example, at the AMA Amateur National Championships, held each year at Loretta Lynn's Ranch in scenic Hurricane Mills, TN, there are special classes for girls and women. 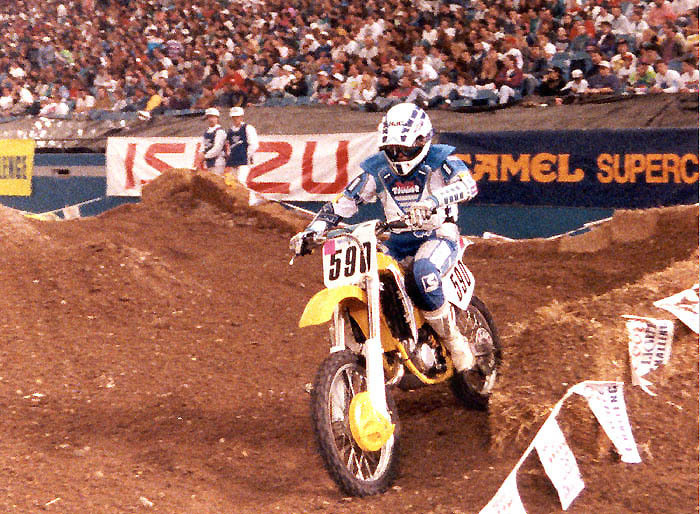 In this supercross race, an invited gate of 8 women racers from around the mid-west and 8 Vets over 50 years old were gated as two separate classes racing together on the track at the same time. The gals took the first drop, getting a 15 second head start before the gates dropped again to start the guys. The men not only raced amongst themselves, but also tried to see they could they could catch any of the gals, and the gals all tried to stay ahead of the men (this was the "crowd entertainment part" of the race)! This was quite an experience. 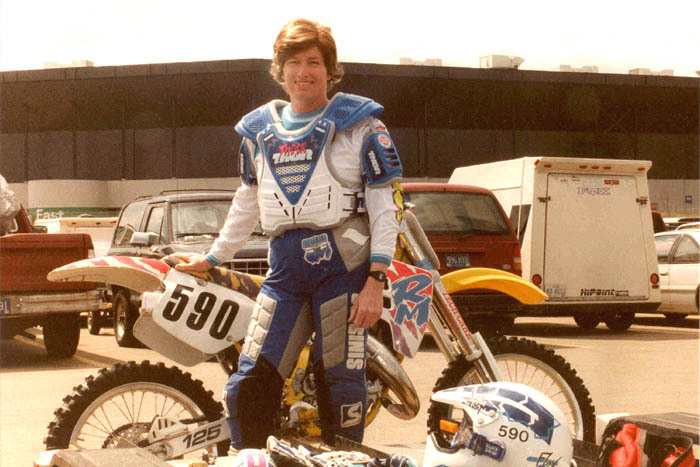 At the time, I was racing MX as an enthusiastic but rough-around-the-edges 125 Beginner in the Motocross Racing Association (MRA). My friend Debbie Mott recruited me into the lineup of 8 women. 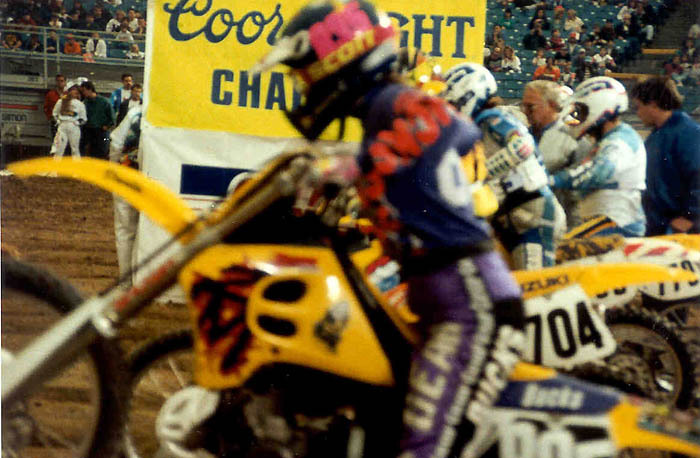 Debbie was an experienced intermediate-class racer who'd been racing with the guys in District 14 AMA motocross events, and who'd placed high in the women's class in the Nationals at Loretta Lynn's. She'd seen me race in some AMA events, and thought I might be able to handle the supercross track and do OK out there. I didn't have much racing experience yet, but life is short, right? There are some thing you've got to do when the chance present itself, even if you aren't really ready. Especially if the chance to do stuff like this is a unique opportunity that might never come again. I thought about it for a while, and then decided what the heck, this is a lifetime opportunity to do something really cool. I hoped to at least complete the race without crashing out! As it turned out, I somehow managed to end up 5th of the 8 women, and was the last of the gals not to be overtaken by the fast lead Vet 50+ racer. You can get an even better sense of the size of the jumps when you look down from the top them, getting more of a rider's view from up there. Here Charlie takes a snapshot of me on top of one of the jumps, while I take a photo looking down at him! Finally it's race day, and the pro races get underway. We watch the incredible race action for a while, passing some time before heading out to the pits to get ready. 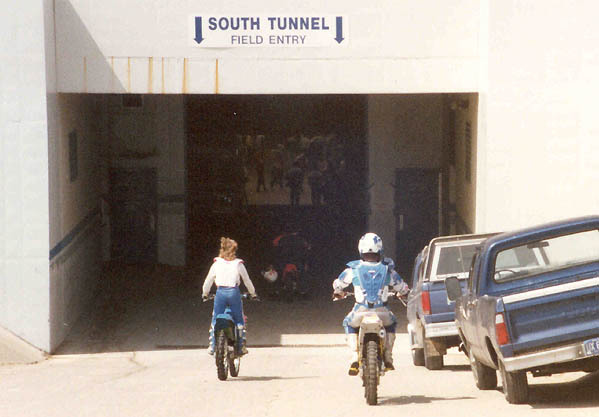 To get back into the Dome on my bike, I rode down into and through the South Tunnel, which passed under the south spectator stands and out onto the stadium floor into to the starting-gate area. Going through the South Tunnel was quite an experience. There was a powerful wind rushing out through the tunnel, because positive air pressure was constantly pumped in there to keep the Dome's ceiling up. Then, just as the wind and noise of the rushing air subsided, I rode out into the arena. There was a huge crowd in the stands, and the noise is almost deafening down on the stadium floor. In the first photo below, you can see a pro race just starting. The gates have just dropped and the bikes are leaving the line. Off to the left in the distance, you can see where the track goes high up into the stands, then turns tightly and falls back down into the arena. You can also see some of the large jumps, such as those at the finish line. In this photo the pros will head down the starting straight, turn into a sharp, tight left turn, and then on into the technical series of jumps and turns that follow. The area just behind the yellow banners behind the starting gates is where the riders for the next race will line up. This is where the riders in Lynn's race were now gathering. As the final pro heat-race wound down before the intermission, my heart began pounding. What have I gotten myself into? Am I really ready for this? When the intermission began, the announcers introduced us and we took a practice lap around the track. Gads, those obstacles were steep! One lap wasn't enough to really figure the track out, but it was enough to begin to wondering how many laps I'd get in before I crashed-out. I managed to get around OK though, even in the incredibly steep and short-pitched whoop section. Right after the practice lap, we all pulled into the starting gate, and I began psyching up for the start. All of a sudden it was time to go. The gate dropped, and we were off! It was hard for Charlie to get pictures, since most of the action was out of his view from the starting gate area. However, he still managed to get some really nice mementos, as you can see. I'm not sure how I managed to stay upright for the whole race, especially in the steep, peaked whoops. But I did, and what a thrill it was to ride that track! What an experience! I somehow managed to avoid any spills and finished 5th of the 8 women. I was the last of the women not to be overtaken by the fast lead Vet 50+ racer. Riding that track gave me even more appreciation for what the pro riders do out there. Like lots of other racing action over the years, this event created wonderful memories. Wow did we have fun! I went on to do a lot of racing at MRA during the mid-nineties, moving up to an RM250 in the Vets 45+ class, and placing in the MRA season championships for four years. 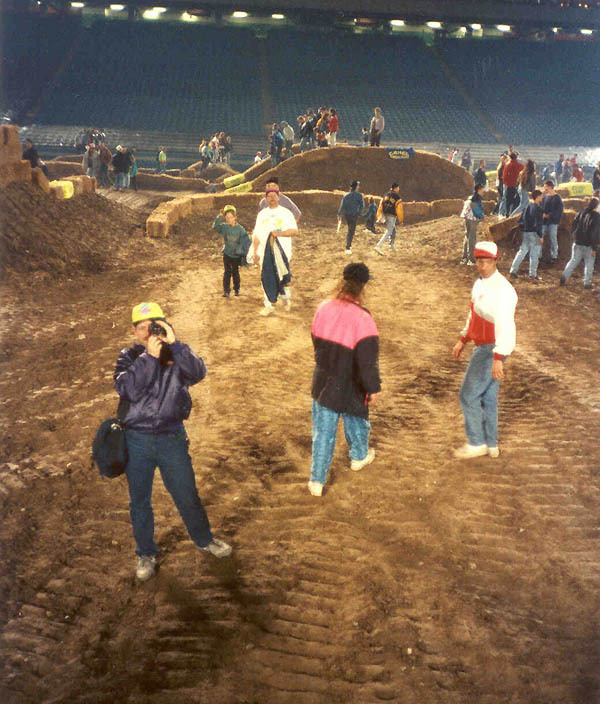 But I'll never forget racing in front of the crowd on the Silverdome supercross track back in '93. It was one of those peak experiences, and I'm so glad that I seized the opportunity to do it.